Chelsea have reduced prices for away fans travelling to Atletico Madrid for the Champions League semi-final by £20 a ticket. The Blues want to "thank travelling supporters for the fantastic backing they have given to the team over the course of the whole season". 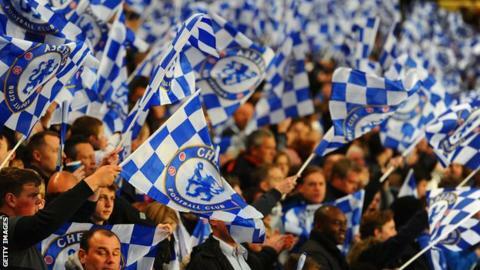 The Stamford Bridge club have been allocated 3,071 tickets for the first leg in Madrid on 22 April. Prices for the match now range between £38 and £79.50. Champions League winners in 2012, Chelsea reached the last four by beating Paris St-Germain on away goals after beating the French side 2-0 in London on 8 April. Real Madrid face Bayern Munich in the other semi-final.